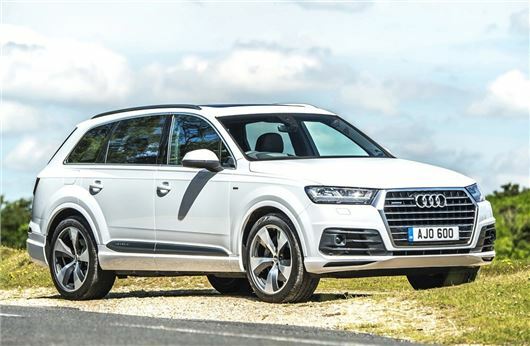 The new Audi Q7 is now available with a lower powered version of the 3.0 TDI engine. The 218PS engine is priced from £47,755 and is available in both SE and S line trim. It may be the entry-level engine alongside the 272PS version of the same V6 diesel engine, but with a hefty 500Nm of torque it's certainly no poor relation. Combined with an eight-speed tiptronic automatic gearbox it will cover 0-62mph in just 7.3 seconds. But where the lower powered engine excels is in terms of economy. It can average a claimed 49.6mpg when fitted with smaller 18-inch wheels, with CO2 of 148g/km. Sticking with the standard 19-inch or optional 20-inch wheels will still see official economy of 48.7mpg, helped by the significanty lower weight of the latest Q7 compared to its predecessor. Much of this weight reduction is down to new all-aluminium doors and a lighter body structure.